The Politics of Education provides an introduction to both the political dimensions of schooling and the politics of recent educational reform debates. The book offers undergraduates and starting graduate students in education an understanding of numerous dimensions of the contested field of education, addressing questions of political economy, class, cultural politics, race, and gender. 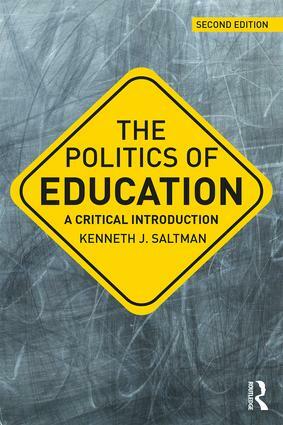 Noted scholar Kenneth Saltman introduces contemporary educational debates and seriously considers views across the political spectrum from the vantage point of critical education, emphasizing schooling for broader social equality and justice. Updates to this second edition work through contemporary reform debates that include topics such as the reauthorization of ESEA, race and diversity, standardized testing and common core, and classroom technology. With opportunities for readers to engage in deeper discussion through Questions for Further Discussion and a Glossary of key terms, The Politics of Education remains a much-needed, accessible primer, providing the critical tools needed to make sense of the current politics of education. The Politics of the Status Quo or a New Common School Movement?